More offices are incorporating the warmth and comfort of residential interior design to enhance the happiness and productivity of employees. Office design that is flexible and inviting lets people work freely and helps foster collaboration. Developers and designers alike are redefining and redesigning office space by blending residential influences such as homely furniture, warm décor and wooden stairways into corporate spaces. By veering away from traditional floor plans and using open concepts, the workplace encourages employee connections that occur naturally. It can bring friendliness to space while keeping it professional. Incorporating warm and inviting residential elements ‒ when properly executed ‒ can have a positive impact on the well-being of employees; this, in turn, translates into an increase in motivation and productivity. From an employer’s perspective, this kind of design can be a great investment to encourage employees to remain engaged in their work. When choosing different items, keep in mind that the design elements should not only meet the specific needs of the people but also reflect the company’s brand and culture. Focus on the ambience of the office by creating a variety of spaces. Have open rooms for meetings and brainstorming or quiet, secluded corners with comfortable furniture that allows people to work on deadlines and heavy projects. Consider lighting, noise levels, temperature and other elements that can help eliminate distractions and give the office a friendly, informal vibe. When fitting out the office, remember to choose durable furniture and functional amenities in your design. Although home elements can be incorporated, an office will have more foot traffic. Therefore, consider the main thoroughfares for people moving around and the quality and practicality of items used. For example, wider staircases for easy mobility, a larger kitchen with dining areas and a coffee machine or personal storage areas. 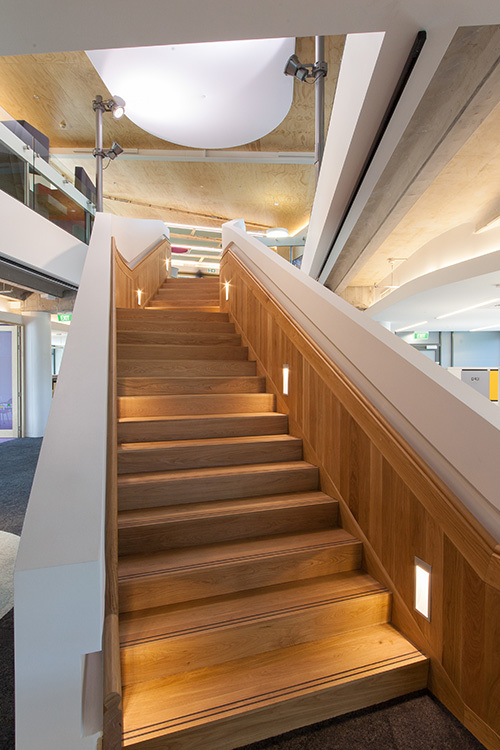 Stairs are an important design element in an office space. As something that meets heavy foot traffic, commercial stairs need to be both functional and beautiful. They encourage employees to be physically active, are hardwearing and need to comply with fire safety standards. At Ackworth House, we design and manufacture stairs for commercial buildings that add aesthetic value to your office space. We combine appearance with function by using imaginative designs with high-quality materials and craftsmanship to match your office interior ‒ whether you prefer a homely, traditional, formal or industrial style. Our range of designs helps architects achieve the balance between comfort and functionality that an office needs. You can choose from glass, timber or steel according to the overall look you want for your office. We also work with clients who have their own specifications and preferences. We guide you through the entire process ‒from brainstorming the designs to the completion of the project. Spruce up your office space with Ackworth House’s wide selection of commercial stairs. Feel free to get in touch with us today for more information. You may call us on 0800 225 967 for any inquiries. We extend our services to homes and businesses in Auckland, Whangarei and other areas of New Zealand.